Club Car Precedent 24 Cell Watering System is the perfect watering kit system to keep your golf cart batteries from drying out which could damage the battery cells inside. This could lead to a shorter life spam for the batteries. Golf cart batteries need to be filled several times a month to ensure a long lasting battery life, with this time saving kit refilling your battery cells is quick, safe, and cost efficient. Safer These valves eliminate the need to remove the vent caps for maintenance,which reduces health hazards to people or damage to floors and equipment. When a fully-charged battery is filled to the correct level, the system shuts off automatically, preventing over-filling. Faster These single point systems, there no more opening vent caps manually and filling each cell individually. Each battery equipped with an easily installed series of interconnected valves which replace your existing vent caps. An electrolyte level indicator gives a visual indication that the cells were filled after watering. Waer flows through a single connection, filling each cell accurately and efficiently. The whole process takes less than one minute. Since batteries need to be filled several times each month, the 90-95% savings in time translates into substantial cost savings. With watering times dramactically reduced, employees become available for other tasks. Better These clean, streamlined systems prevent harmful corrosion build-up on batteries, prolonging battery life when refilled accurately and consistently. Centurion Golf Valve Technology: Each golf cart watering kit comes with the centurion golf valve, an innovative clip-in valve that makes installation of pre-strung systems fast and easy. Water flows through a single connection reducing labor costs by accurately filling each battery set in less than 30 seconds. Each valve has a water level indicator allowing for visual inspection to determine whether water is needed and to ensure that every cell is being watered properly. The golf valves have a spark arrestor making it the safest watering system available. It eliminates acid and gas exposure while filling the batteries. Electrolyte level indicator, built right into the valves that replace your battery caps, lets you know that the battery is properly filled. It is visible from the front and side of the valve. Hydrometer readings can be taken without removing the valves from the battery. Encapsulated valve protects the float to ensure that the moss shield does not interfere with the action of the valve. Clip-in design makes installation of systems much faster and easier. 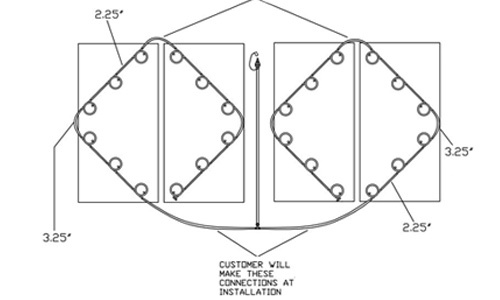 Barb design eliminates the need for clamps and is angled to make installation easy in tight configurations. The low profile valves allow easy access to the battery and reduces the risk of damage from battery cables. Solid one piece float is acid, temperature and impact resistant. Solid construction will not absorb water. Widest Pressure Range: The valves operate with pressure up to 35 psi using our filling devices. House static pressure should never be more than 80 psi. If needed, a variety of pressure regulators are available to lower pressure. PLEASE NOTE: Diagram above illustrates batteries and kit configuration. Please verify this is the correct configuration for your application before purchasing. Need more than one Club Car Precedent Watering Kit? We offer great discounts on quantity orders and FREE SHIPPING offers are available. Need more EBWS-KITC-08BC? We offer great discounts on quantity orders and FREE SHIPPING offers are available. No specification or documents available currently available for EBWS-KITC-08BC. If you require a spec sheet, a msds sheet or any additional documents, please contact us and to request them. We will work to accommodate you.